Welcome to our website. 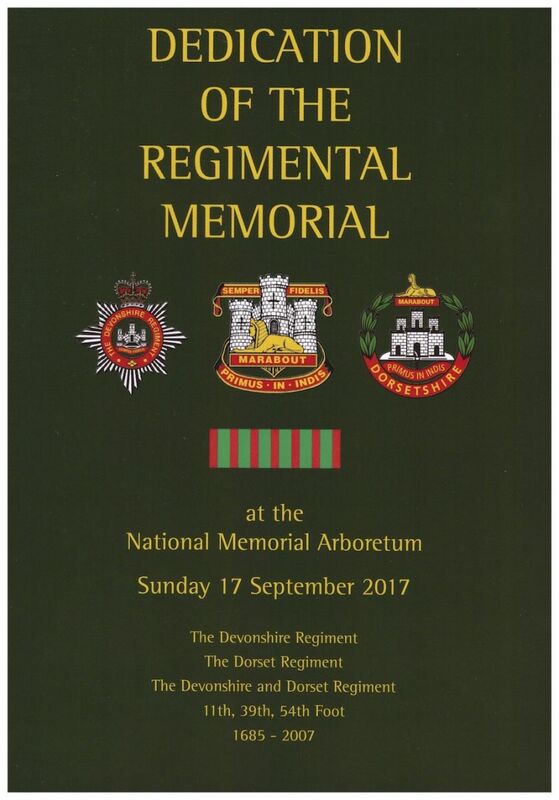 Our Association exists to preserve the memory of The Devonshire and Dorset Regiment and its forebears, The Devonshire Regiment and The Dorset Regiment, and to maintain the close comradeship that our members found during their service in these renowned British Army infantry regiments. We also give our staunchest support to the new Regiment into which our Regiment was merged in 2007 - The Rifles, in which the Infantrymen of Devon and Dorset now serve. Please browse our site to learn more about our history, objectives, organisation and activities. Our About Us and Events pages will tell you who we are, how we are organised and alert you to our future gatherings and events. 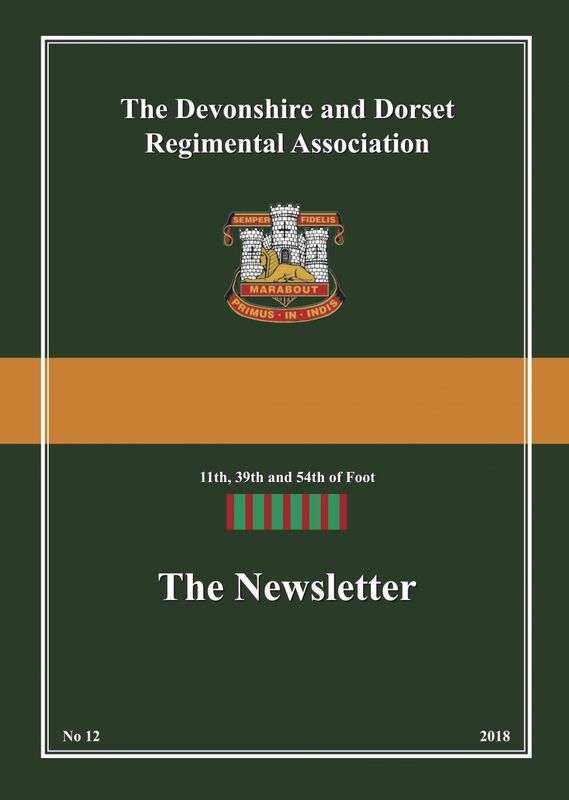 Membership of our Association is open to anyone who has served with The Devonshire and Dorset Regiment, its antecedent Regiments and members of our successor Regiment - The Rifles. See our Association Rules for the full details. If you fall into any of the categorie listed there you can be an Association member. 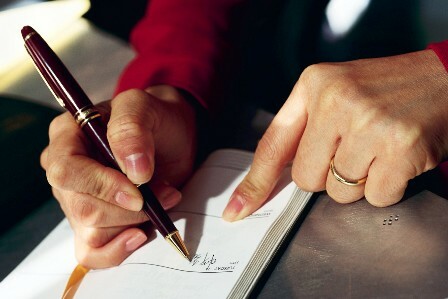 You should supply us with your details so we can add you to our Registered Members List. Visit our Members Area page to find out how. It only takes a minute to register and you only have to apply once. Once you have registered, we will supply you with a password so you can log into the Members Area pages on this website. There you will get additional Association information that is only for our members, such as detailed news, more information about our activities, contact details for our Branches and Focal Points and the e-version of The Janner, our monthly newsletter. 05 Plymouth (Late Devons) Branch meeting, Crownhill Families Club, at 10.30-12 noon. 05 Gillingham Branch meeting, RBL Club, Gillingham, at 7.30 pm. 19 Books of Remembrance Page Turning Service, Sherborne Abbey 11am​. Check our Calendar page for the details and our Local Organisation page for contact information. Why don't you join our members at our local gatherings? They would be delighted to see you. In early May 1918, the depleted British 8th Division, including 2nd Devons, moved to a previously tranquil area of the Western Front north west of Reims to rebuild. On 26 May, their peace was shattered by a major German assault in the Aisne area - ‘Operation Blucher’. The 2nd Devons gallant stand against this German advance at Bois de Buttes is legendary. After the battle, the French awarded the whole battalion with the Croix de Guerre. The ribbon, shown above, was worn thereafter on the uniforms of Devons, Devon and Dorsets, and now our successors in The Rifles. The Devonshire and Dorset Regimental association organised a centenary commeration that took place at the memorial for the battle of Bois Des Buttes in La Ville-aux-Bois-Les-Pontavert in France. Click on the Croix de Guerre ribbon for more. 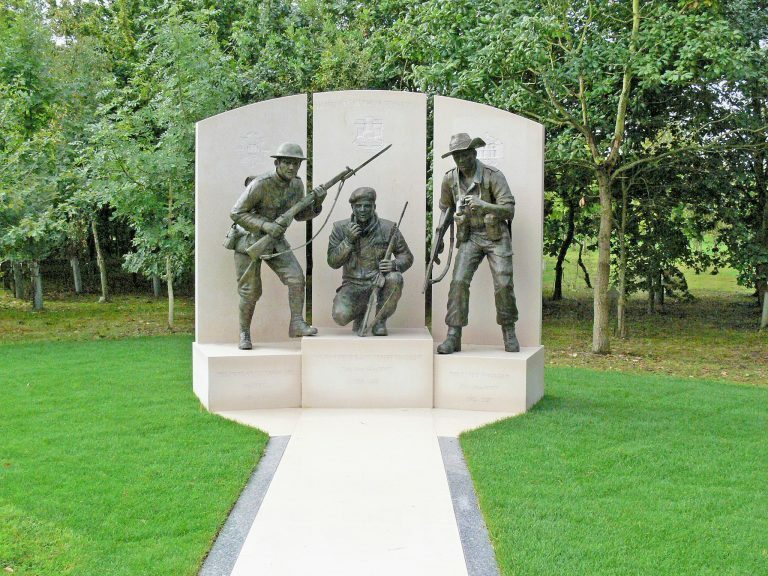 On 17 September 2017, we unveiled our wonderful National Memorial at the National Memorial Arboretum in a Dedication Ceremony attended by members of our Regimental Association and their guests. This happy conclusion was made possible by the artistic excellence of our sculptor, Vivien Mallock, and by the hard work of a large team of Association members who planned and managed the project. It is the outcome of the overwhelmingly generous support to our Memorial Appeal by a host of individuals and organisations across Devon, Dorset and beyond. Read all about the Dedication Ceremony here. Visit our National Memorial Page to read all about it. ** October 2018: Members of the Kenya Vets / 4th Devons / 1st RV / D and D’s combined lunch, Wyvern Bks. More information here. 11 May 2019: Devonshire and Dorset Regimental Association annual reunion. 11 May 2019: Devonshire and Dorset Regimental Association annual reunion after party venue tbc. 29 June 2019: National Armed Forces Day. Events are happening up and down the country to find what's happening in your area take a look at the Armed Forces Day website. With so many events taking place there is sure to be something close by. 16 May 2020: Devonshire and Dorset Regimental Association annual reunion. The Devonshire and Dorset Regimental Association facebook page. We now have a facebook page click here to view. The Keep Military Museum: The Keep Military museum has had it's website refreshed and it is now looking better than ever. It has a number of new features including a redesigned online shop. Take a look now by using this link The Keep Military Museum. Defence Privilage Card. A discount card for members of the Armed Forces, families and veterans, has been introduced. Members who have served can join. Employment. When we are informed of employment possibilities, we place them here. Supporting our Association. Our Association is a charity and needs your suppport. See how you can contribute. Preparing for the Death of a Loved One. Nobody likes to think of their eventual passing, but preparations made whilst you are fit and healthy can make managing afterwards much easier for your loved ones. On this day both the 1st and 2nd Battalions of the 54th of Foot (Dorsets) were part of a British expeditionary force that landed at Aboukir Bay, close to Alexandria, in Egypt. The British then conducted a five-month campaign against Napoleon’s Armée de l’Orient. This was a tough operation. In addition to battle casualties, the battalions suffered badly from a variety of diseases. Nevertheless, the British prevailed. This action took place between 8 and 12 March 1918, during the Sinai and Palestine Campaign of World War I. Fighting against the Turkish Army took place over an area which extended from the Mediterranean Sea to the edge of the Jordan Valley. 2/4th Dorsets were in the 75th Indian Division and operating within sight of the Jordan Valley. Their final objective was near the ancient town of Arsuf, some 10 miles north of modern-day Tel Aviv. The 75th took the Turkish positions following a creeping artillery barrage. In March 1945, 1st Devons were part of the British 20th Indian Division, which was advancing through Burma to capture Mandalay from the defending Japanese. The flat plain on which the Battalion found itself was dotted with villages and hamlets, each of which had to be cleared of enemy strong points. The Devons did particularly well in the severe fighting between the Irrawaddy and their objective Kyaukse, to the south of Mandalay. After the 1914 German invasion of Belgium and France, the Allies wished to take advantage of the arrival of new British divisions by taking the offensive. The British component was to attack in the area on Neuve Chapelle, a village that lies between Bethune and Armentieres. The ground here is flat with many small drainage ditches and overlooked by the long Aubers Ridge. This battle was the first large scale attack undertaken by the British during the war. In wet, snowy weather the British 1st Army moved forward following a heavy artillery bombardment. 2nd Devons were in the 23rd Brigade in the 8th Division. Their job was to support an assault by two other battalions in the area of 'The Moated Grange’. This succeeded and the Devons moved forward to dig in. Over the next few days, they faced determined German counter-attacks, and attempts to move further forward were unsuccessful. Indeed, after initial success, the whole British assault became bogged down and little ground was gained. The Battalion’s causalities were 9 officers and 274 soldiers, killed, missing or wounded. The British Army learned many lessons at Neuve Chapelle: the difficulty of breaking through enemy positions; the need for greater weight of artillery, the vulnerability of communications and the need to move reserves up swiftly.